Rolling Stones star Ronnie Wood has landed a top award as one of the UK's leading DJs - just a year after launching his broadcasting career. The chart veteran, 63, was named Music Radio Personality Of The Year at the Sony Radio Academy Awards event in London - beating figures such as Chris Moyles. Radio 2 star Jeremy Vine was a double-winner, including a prize for his interview with Gordon Brown which famously left the then Prime Minister with his head in his hands. Long-serving presenters Jenni Murray and Annie Nightingale were each given honorary awards at the annual event which recognises the cream of radio talent. And Danny Baker - who recently returned to work after being treated for cancer - was given a rousing reception at London's Grosvenor House Hotel as he collected the prize for Speech Radio Personality Of The Year. 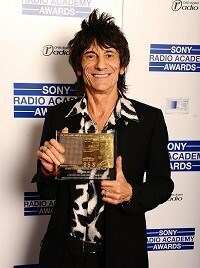 Stones guitarist Wood - known for his colourful love life and battle with the bottle - landed his prize for his series on Absolute Radio. He beat Radio 1's Moyles and other nominees such as Jarvis Cocker, Frank Skinner and Scott Mills to the prize. Vine was named Speech Broadcaster Of The Year, while his interview with Brown was named Interview Of The Year. Radio 4 favourite Jenni Murray - who has hosted Woman's Hour since 1987 - was honoured with the Gold Award. Fellow broadcasting stalwart Nightingale, the longest serving presented on Radio 1 after 40 years service, took the Special Award. Radio 2's Simon Mayo took the award for Best Sport Programme, while Radio 1's Zane Lowe was named Music Broadcaster Of The Year for a fourth time. Heart-throb scientist Professor Brian Cox was rewarded with the the Best Speech Programme for his Radio 4 series, The Infinite Monkey Cage. And The Frank Skinner Show on Absolute landed the Best Entertainment Programme prize. George Michael is to go on tour again nearly three years after he said he would quit live performance - this time accompanied by a symphony orchestra. The Beastie Boys have revealed how Adam "MCA" Yauch's cancer made the hip-hop trio appreciate their time together. Lady Gaga plans to cultivate her fan base by releasing exclusive tracks of her new album Born This Way on FarmVille, a popular Facebook game. Kevin Macdonald, the Oscar-winning director, said he was inspired to make his documentary about reggae star Bob Marley while filming in Africa. Noel Gallagher has claimed he feels "violated" after football veteran Gary Neville used Oasis lyrics to gloat about Manchester United's success in the Premier League. Trevor Horn, the record producer and musician, is collecting his CBE from the Prince of Wales at Buckingham Palace. AC/DC have said you won't find members of their band on the panel of a singing contest, because they're not exactly fans of the reality show route to success. Rapper-producer Pharrell Williams is expanding his focus to include a new TV network aimed at the online generation.